If a picture is worth a thousand words, what is the net worth of a video? With free video resources such as Youtube and the ease with which instructors can curate and create their own, augmenting traditional print materials with video content in online, blended, and face-to-face classes is common practice. Videos have the capacity to engage learners of all modalities, bringing together auditory and visual support. Add captioning, and you support diverse learning needs through a single medium. You can edit any video you have created or accessed via URL address, such as Youtube. 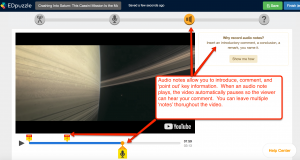 Once you have uploaded your video to EdPuzzle, you can use the application’s tools to customize the student viewing experience. Much like a Google Form, students access an EdPuzzle assignment via a shared link or directly through your Learning Management System (LMS) such as Google Classroom or Canvas. As an instructor, you are able to view the assignment analytics which includes individual student responses. You can now use video assignments to award points and provide individual feedback. 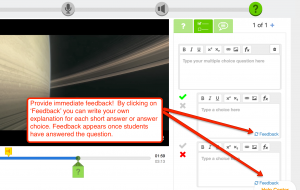 This tool is not limited to assessment, but allows you to teach through video. Take your students anywhere and everywhere without the limitations of time, space, and financial barriers. Bring any topic to your students while adding your expertise and passion to the experience. Students can engage in the video lesson as many times as needed allowing the viewer to control the pacing of the lesson. I teach in the School of Education. While there is a theoretical component to coursework, students must apply this theory daily in their student-teaching placements. My students can read about classroom management and lesson design, and they can watch their mentor teacher in their student teaching; however, as a ‘novice’ in their profession, they do not often recognize the ‘theory’ at work within the practical setting. 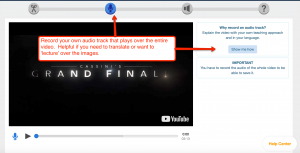 With EdPuzzle, I have been able to take videos of teaching in the actual elementary school classroom, and become the ‘little bird’ whispering in their ear. 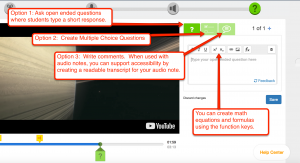 Through the audio notes and questioning options, I am able to guide their viewing and focus attention on key theoretical concepts as they occur in a practical setting. EdPuzzle is a useful tool in any discipline in which students need practice applying theory in a practical setting. How else can I use EdPuzzle? The following are some suggestions for integrating EdPuzzle into your course. Those of you already using EdPuzzle, please share your ideas in the comments! Experience an EdPuzzle I used in my summer class with credential candidates. This assignment was intended as ‘guided practice.’ Students were to experience the video. My comments, questions, and automatic feedback were intended to deepen student understanding of writing learning objectives.